ColorTech water saver fittings are engineered for superior performance and durability, meeting the requirements of ANSI/ASME A112.18.1M and are certified to CAN/CSA B.125.M89 by CSA International. 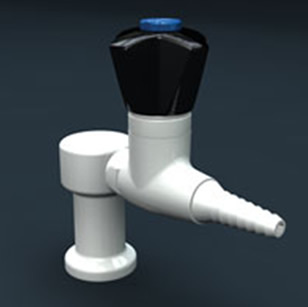 Water saver fittings for Color Tech faucets may be furnished with vacuum breakers to prevent backflow into the potable water system. The vacuum breakers are designed specifically for laboratory applications and as such, will seal properly and prevent spillage under very low flow conditions, even when elevated on the front face of a fume hood. Vacuum breakers are certified by the American Society of Sanitary Engineers (ASSE) under ASSE Standard No. 1001 and by CSA International under CSA Standard CAN/CSA-864 Series M-88. 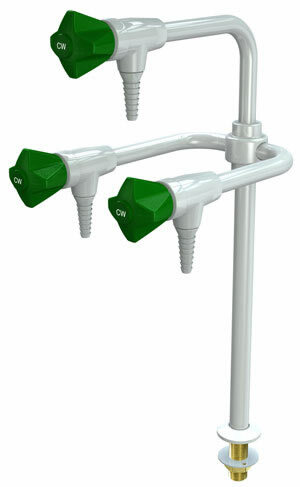 ColorTech fittings are available with a wide range of optional features to meet the needs of any laboratory user. 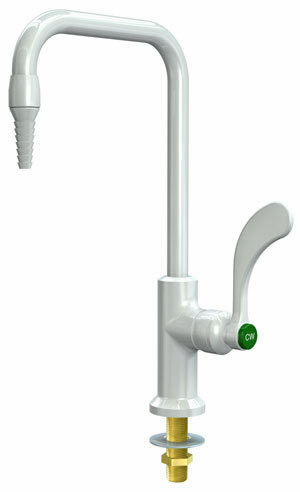 In addition to offering laboratory faucets and valves, Total Lab Solutions (TLS) also offer a comprehensive line of emergency eye wash and shower equipment designed for the needs of the laboratory environment. These products were first introduced in the mid-1970s with the goal of producing the highest quality equipment of emergency eye wash and drench showers. ColorTech fittings shall have a powder coated finish in white, gray and tan. Coating material shall be free flowing epoxy/polyester hybrid powder with a particle size of 35-70 microns. Surfaces to be coated shall be (a) polished or sand-blasted to produce uniform fine-grained surface and (b) immersed in a phosphoric acid cleaning solution to remove thoroughly all oil, grease and other foreign substances. Following cleaning, coating material shall be electrostatically applied to all exposed surfaces. After application, coating shall be fully baked to permit curing. Surfaces shall have a minimum coating thickness of 2 mils. ColorTech fittings shall have a polished chrome plated finish with clear epoxy coating. All exposed surfaces shall be polished and buffed, then electroplated with one layer of nickel and one layer of chrome. Each layer of plating shall completely cover all visible surfaces. Following plating, surfaces to be coated shall be thoroughly cleaned and degreased. Clear epoxy coating shall then be applied to all exposed surfaces and fully baked to permit curing. Surfaces shall have a minimum coating thickness of 2 mils. ColorTech fittings shall have a satin chrome plated finish with clear epoxy coating. All components shall be polished and buffed. Exposed surfaces shall then be further polished to an AISI No. 6 brushed finish which is fine-grained and uniform. Components shall then be electroplated with one layer of nickel and one layer of chrome. Following plating, surfaces to be coated shall be cleaned and degreased. Clear epoxy coating shall then be applied to all exposed surfaces and fully baked to permit curing. Surfaces shall have a minimum coating thickness of 2 mils. Application: Deck mounted fixture with two water valves. Finish: Fixtures are available with a choice of six powder coated finishes. Specify finish when ordering: white, gray, tan, polished chrome with clear epoxy, satin nickel with clear epoxy or satin chrome with clear epoxy. 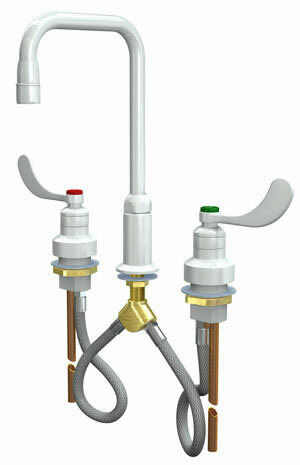 Valve Units: Water saver self-contained renewable compression units with replaceable stainless steel seats. Goosenecks: (2) 6” rigid goosenecks with serrated nozzle. Inlet: 3/8” IPS male inlet. 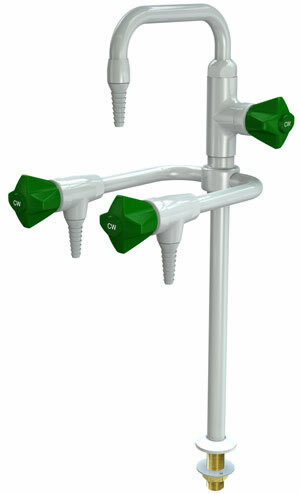 Outlets: 3/8” IPS female outlets with removable seven serration hose ends. CTFS-370WSA Same as above except with Flow Stop. Finish Fixtures are available with a choice of six powder coated finishes. Specify finish when ordering: white, gray, tan, polished chrome with clear epoxy, satin nickel with clear epoxy or satin chrome with clear epoxy. 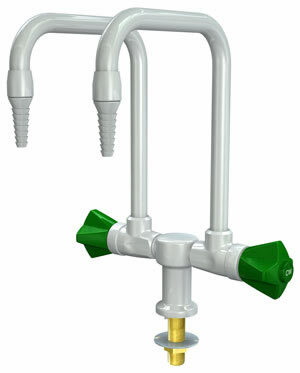 Riser: 1/2” IPS brass riser with tee fitting and (2) outlet arms. Inlet: 1/2” IPS male inlet. CTFS-381WSA Same as above except with Flow Stop. 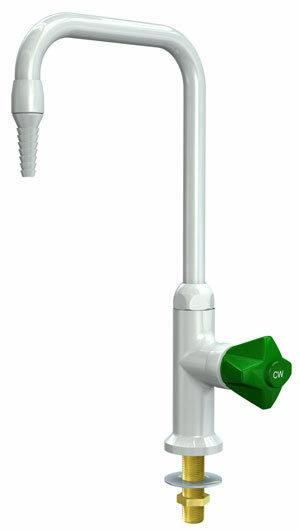 Application:`Deck mounted fixture with two water valves. Finish`Fixtures are available with a choice of six powder coated finishes. Specify finish when ordering: white, gray, tan, polished chrome with clear epoxy, satin nickel with clear epoxy or satin chrome with clear epoxy. CTFS-382WSA Same as above except with Flow Stop. 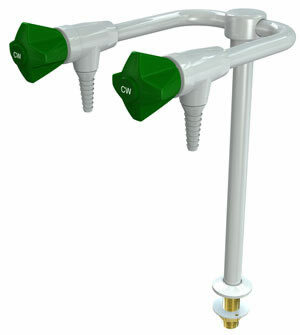 Application:`Deck mounted fixture with three water valves. 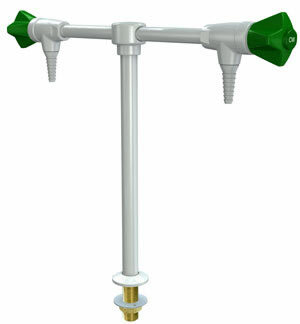 Riser: 1/2” IPS brass riser with center ­fitting and (3) outlet arms. CTFS-385WSA Same as above except with Flow Stop. 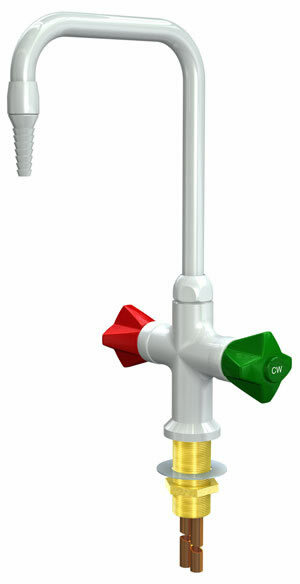 Application: Deck mounted fixture with three water valves. Finish Fixtures are available with a choice of six powder coated finishes. Specify finish when ordering: white, gray, tan, polished chrome with clear epoxy, satin nickel with clear epoxy or satin chrome with clear epoxy. Riser: 1/2” IPS brass riser with center fitting and (2) outlet arms. Spout: 6” swing spout mounted on ­center valve. 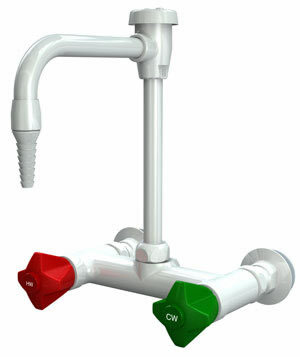 Application: Deck mounted mixing faucet for hot and cold water. 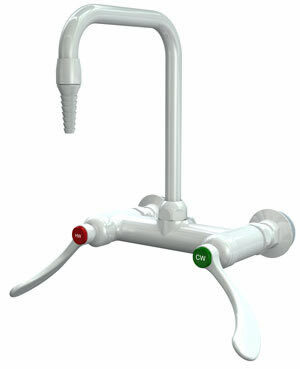 Gooseneck: 6” convertible rigid/swing gooseneck. Inlets: 1 3/16” male shank with (2) 3/8” OD inlet tubes. 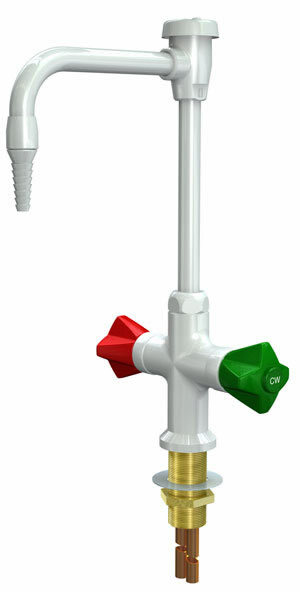 Outlet: 3/8” IPS female outlet with removable seven serration hose end. If aerator is desired in place of hose end, add suffix "-55". Handles: 4" forged brass wrist blade handles with color-coded index discs. 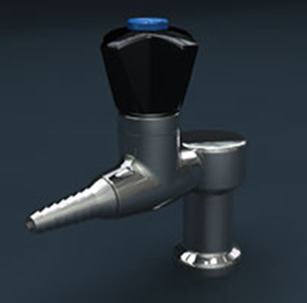 Vacuum Breaker: Integral vacuum breaker to prevent backflow. Handles: 4" forged brass wrist blade ­handles with color-coded index discs. Inlets: (2) 1 3/8” male shanks with 3/8" OD flexible copper tube inlets. Center fitting has 3/8” IPS male shank. Furnished complete with locknuts, washers and (2) flexible PVC hoses. 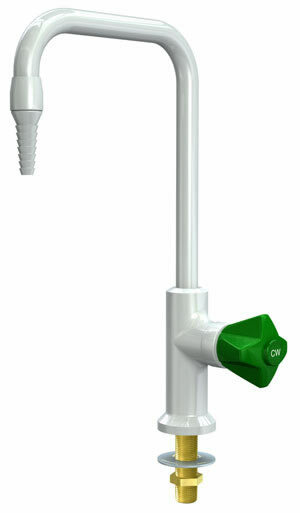 Outlet: 3/8” IPS female outlet with removable aerator. Note: Faucet may be used with a foot operated for hand and foot control. Add suffix “TWI” to faucet model number. 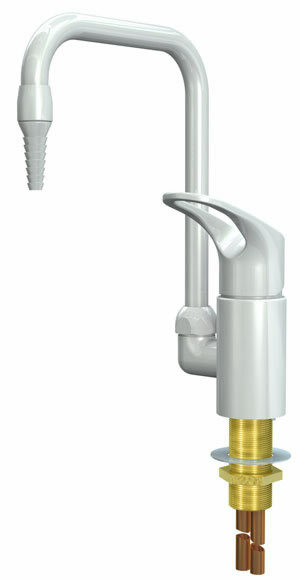 Note: Faucet may be used with a foot-operated valve for hand and foot control. Add suffix “TWI” to faucet model number. 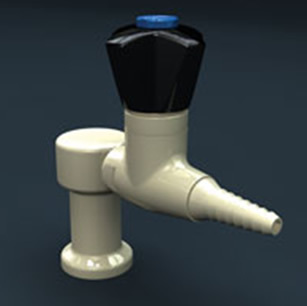 Valve Unit: Ceramic disc mixing cartridge. Handle: Forged brass lever type handle. 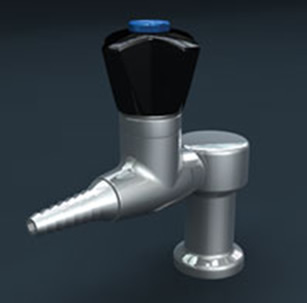 Handle rotates 90 degrees to select water temperature. Inlets: 1 3/16" male shank with (2) 3/8” OD tubes. 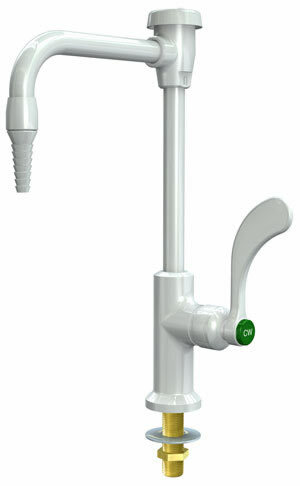 CT-4604VB same as CT-4604 except with vacuum breaker (VB) gooseneck. Inlets: (2) 3/8” IPS union inlets with mounting shanks, locknuts and washers. Outlet: 3/8” IPS female outlet with removable seven serration hose end.If aerator is desired in place of hose end, add suffix "-55". 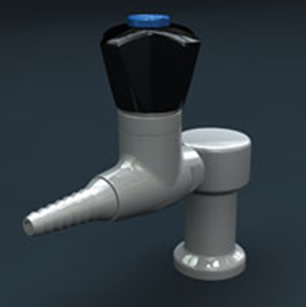 Valve Units: Water saver self-contained renewable compression units with replaceable stainless steel seats. Handles: 4" forged brass wrist blade ­handles with color-coded index discs. 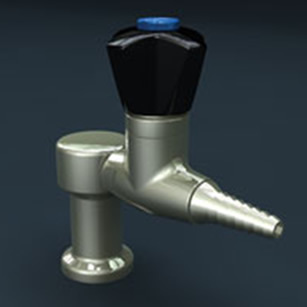 Quality Assurance: Faucet is fully assembled and factory tested prior to shipment. CTFS-1714BH-WSA Same as above except with Flow Stops. CTFS-1714VB-WSA Same as above except with Flow Stops. 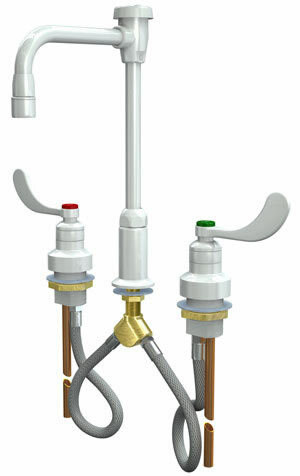 Valve Unit: Water saver self-contained renewable compression unit with replaceable stainless steel seat. Gooseneck: 6” rigid gooseneck. Gooseneck is furnished in right hand configuration unless left hand or 180 degrees is specified. 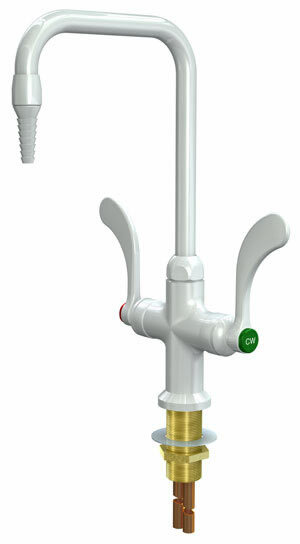 Outlet: 3/8” IPS female outlet with removable seven serration hose end. CTFS-611 Same as above except with Flow Stop. Deck Mounted, Rigid Gooseneck, Wrist Blade Handle BH). Handle: 4" forged brass wrist blade handle with color-coded index disc. Gooseneck: 6” rigid gooseneck. 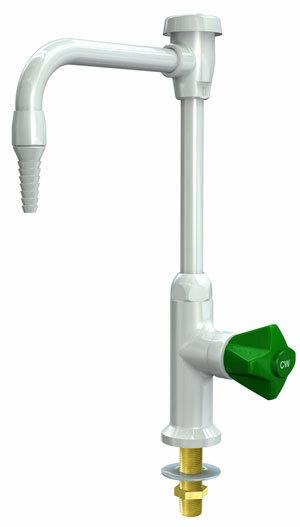 Gooseneck is furnished in right hand configu­ration unless left hand or 180 degrees is specified. CTFS-611BH Same as above except with Flow Stop. Water saver self-contained renewable compression unit with replaceable stainless steel seat. CTFS-611VB Same as above except with Flow Stop. CTFS-611VB-BH Same as above except with Flow Stop. CTFS-614 Same as above except with Flow Stop. CTFS-614VB Same as above except with Flow Stop. Color-Tec fixtures are furnished with a powder coated finish to enhance the appearance of the fitting and to protect against corrosion. Unlike alternative brands, Color-Tec fixtures may be ordered in any one of six standard finish colors. 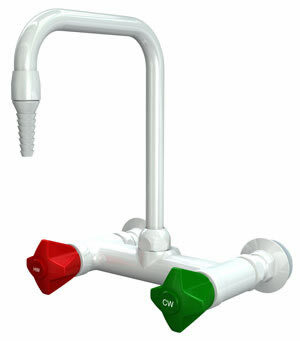 This range of colors assures that the lab fittings will enhance the design scheme and aesthetics of the lab environment. The coating materials used for Color-Tec finishes are specially formulated with blends of epoxy and polyurethane powders. These hybrid blends assure that the finished coating will have an optimum combination of chemical resistance, mar and abrasion resistance, and resistance to fading under ultraviolet (UV) light. Clear epoxy coating applied over a polished chrome plated surface. Finish has a bright chrome appearance with enhanced chemical resistance. Brushed nickel plated surface with clear epoxy coating. The brushed finish has the appearance of stainless steel, with enhanced chemical resistance and concealing fingerprints, watermarks, dust and dirt. Brushed chrome plated surface with clear epoxy coating. The brushed finish is similar to stainless steel except brighter, with enhanced chemical resistance and concealing fingerprints, watermarks, dust and dirt.